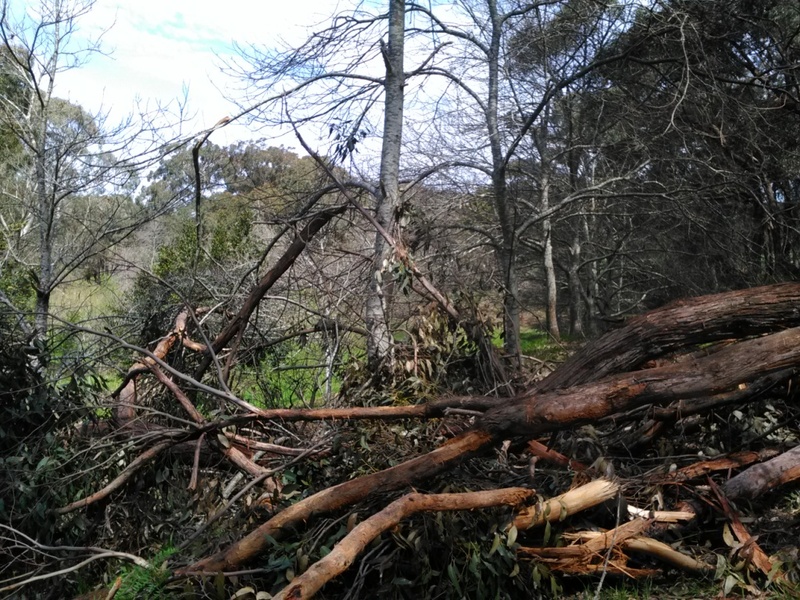 More trees down this morning which means 5 separate events have brought trees down from our neighbour’s scrub onto our chestnut orchard. The trees fell like dominos down the hill mostly roots and all falling on other trees creating a cascade of stringy barks piling on top of each other, spilling out and coming to rest into our orchard and some as far as the valley raspberries. The weather has certainly been challenging with unusually strong winds and rain. This has come after 10 years of below average rainfall which saw our valley and springs dry up earlier this year for the first time in our 33 years here. Jan 73mm Feb 32mm March 57mm April 21mm May 190mm June: 228mm July:276mm August:121mm Sept:337mm . So far in October 181.5 mm in 18 days. As we can’t get out into the orchards, not even to begin the cleanup of fallen trees, I have been kept busy creating works for my Fringe exhibition in February and Quentin busy with fixing chainsaws, generators and now mowers for the local population. I am amazed at some of the things called ‘RAISED BEDS’ I see advertised or in articles, whether for sale new or plans for do it yourself, these are NOT raised beds but CONTAINERS. They are filled with all sorts of growing medium and people think they are growing healthily vegetables. Please think again. Healthy food comes from healthy soil. I know, I’ve heard it all before ‘my soils no good’ Well the essential art of gardening is to enhance the cycle of life by finding ways to restore humus to the soil. All gardeners find their own way to achieve this. All Soil can be improved, sure it may take time but quality produce only comes from quality soil. As you observe your soil .like any other living thing it is always changing and telling its own story. There is more life beneath the soil than above therefore you need to encourage and cultivate its existence. Understanding your soil is a basic requirement for the success of your veggie garden. You can build tremendous satisfaction from working with the soil, building its tilth, fertility & water holding capacity. The curved surface area between the 2 edges of the bed provide more surface area for planting and the penetration and interaction of the natural elements than a flat surface . They also have the advantage of being raised (10-30cm) above the surrounding area adding more life, increasing soil depth, air, more earthworms, and micro organisms and with improving drainage. Beds can be any length, ideally 1 metre wide so you can easily reach across the bed.10-30 cm higher than the original surface. I feel gardens need to be dug especially in the beginning. The tired and compacted soil needs to be woken up, loosened and aerated. Roots from nearby trees that are invading will need digging out. Try to only dig the topsoil. All the life is there. Traditional double digging is a good method to use. In addition the top few cm of soil from the pathways can be dug out and added to the bed. Over time the more compost you add, on a seasonal basis, the lighter the soil becomes. Raised beds can be surrounded by a structure. They should be between 10-30cm high. Although this reduces the surface area it contains the soil. It’s an ideal system on slopes and terraces. It is a disadvantage if there is any risk of running type grasses e.g. couch, kukupa. Tree roots seek out rich soil and water, invading cultivated beds robbing the plants of nourishment and stunting their growth. They should be dug over as often as needed depending on the severity. I have used small permanent raised beds for the past 30+ years. When I started the site of my garden was part of our driveway, highly compacted soil mixed with gravel that sloped away. The tilth improved quickly with raised bed and good biodynamic compost and within a couple of seasons you only required minimum effort to grow anything. Mark out your bed & foot paths. Dig over the bed area . If you think it’s too much work, remember that this is a once off job and it does not have to be done instantly, take your time and you will be surprised how much your soil will reveal about itself as it’s awakened. Top soil from the surrounding area (footpaths) is added and then the soil can mounded up to form a bed approx 1 metre wide - this will increase the soil depth and improve the drainage quite dramatically .Do not dig into the sub soil layer. Quality humus rich compost is dug into the beds *If in the beginning you do not have any compost there are many ‘organic’ fertilisers on the market. Be careful when choosing, for many have added soluble fertilisers. Such as Nitrogen (N) and phosphate (P) for the future go and learn how to make quality compost. · The beds can now be planted. · As the beds warm up & plants become established they can be mulched. If you make the effort this is the opportunity, as there is nowhere else on this earth like your garden, with its own combination of soil, micro climate, microorganisms and YOU. As you interact with your garden, no matter how small, you put your stamp on it and contribute to its individuality and not just have fresh produce but have fresh produce rich in the earth’s own energies that are truly good for you and your family. Nobody else will be able to produce vegetables that taste quite the same as yours. What could be better than eating food grown in your unique garden? Isn’t it interesting that if you wait long enough what you do becomes trendy. For 30+ years we have created a wholistic garden & farm, ‘Garden Quality Farming” in balance with its surroundings. Although it is a commercial orchard it is also a system that embraces the whole and provides opportunities to learn the many skills that have been lost through the generations. A successful example of such a lifestyle is rare let alone so close to a major city and costs the public purse nothing. Whether its educational farm tours that show the overall diversity & balances that can be achieved on any scale.The home orchard , vegetable & herb gardens or natural fibre gardens its all here along with the natural habitat areas, creeks and orchards. Here everything has its place under the cosmos and everything interacts with everything else creating a wholistic system. To achieve such a system takes planning, work and definitely does not happen overnight or in fact after several years. Once the quality environment starts to click into place you can then consider the quality food & lifestyle benefits. When you live a lifestyle in harmony with nature you can have time enjoy your surroundings. What for example is the value of watching a fledgling wattle bird learning to fly or finding a koala in a tree you planted as a 6 inch seedling or walking through the clouds of the common brown butterflies in summer or simply observing the seasons as they pass by. When it comes to food we can boast regular ‘meals that money can’t buy’ everything from the gardens including the wood to cook it. Just as a typical example we can start with goose liver pate- with homemade bread, roast goose or rooster stuffed with fruit and herbs depending on the season, mixed roasted vegetables including carrots, parsnips, garlic, beetroot, onions, fresh greens, chestnut puree (Speciality of the house) followed by a desert with berries, fruits nuts either fresh or preserved to choose from, homemade beer, fruit wines and liqueurs and importantly the time and company to enjoy it. To create a lifestyle based on quality environment, food/flavour, lifestyle you need to first jump into the slow lane so you can enjoy it and then creatively take what ever bit of earth you have be it large or small and get it into balance and harmony because nowhere else in the world will food taste the same as it does from your soil, climate under your human care. Never forget agriculture (& therefore gardening) at its most basic level is the solar gift and work is love in action. Taste of December from our on farm shop. During December our on farm shop can offer many unique tastes all of which are grown and made here from our quality Biodynamically grown produce.. The raspberry harvests have just begun and are available now in 200g punnets. Chestnuts also feature with dried ones that make great stuffing for Christmas poultry, or can be used to make delicious cakes or purees. Chestnut jam is also available. Other jams include plum and walnut, rhubarb and elderflower, fig, quince to name a few. Ever popular fruit vinegars made which make refreshing summer drinks or salad dressings are available in mulberry, elderberry or red currant. Elderflower cordial also makes a refreshing summer drink or add it to your whipped cream in place of sugar. A selections of Deb’s baskets are also available. Our farm shop is opened daily from 10am -6pm. You may have to cooee to attract attention from time to time as we will also be picking the raspberries. We DO NOT have pick your own we believe top quality produce needs to be both grown and harvested in the best way. This afternoon we spent harvesting some wonderful honey from our 2 hives. It was great to see fully capped frames after a disappointing harvest last year. It’s always a great experience although at times a bit stressful .The next harvest will be after Christmas when the chestnuts have finished flowering. Chestnut flowers produce really special honey. Every gardener have their own theories and growing methods.I grow mine in the same bed every year (This is the 10 year). This seems a no no according to Adelaide garden experts but I met many older , mostly Italian gardeners who grow them in the same place every year. In small gardens this is often necessary. I grow all my own seeds either from my own seeds or in the beginning ,Franchi seeds in my own seed raising mix made from my compost and leaf mulch from under the camellia tree. Seeds are planted 2 days before the August full moon.Seedlings are planted out on the September new moon into the tunnel house and the October new moon into the garden. the garden is prepared at least 4 weeks in advance with my best biodynamic compost, lime and wood ash.as my compost is sawdust based ‘raw’ in not really an option.During the first month they receive 3 lots of nettle tea. I use cages to grow them in but by the end of the season they are often trailing out of these. The first ripe tomatoes appear by the end of December in the tunnel house and by late January/ early February. Harvest extends well into April and sometimes May. Rudolf Steiner in ‘Agriculture’ Made some interesting comments regarding tomatoes. “Now, there is still one especially important subject I want to mention. I would like to ask you to carry out very precise experiments this area, experiments which can also be extended to include human beings, if they happen to like this food. You know that tomatoes were introduced as a food only relatively recently. Many people are very fond of them, but they arc also an extraordinarily important thing to study. You can learn an extraordinary amount by studying tomato production and consumption. People who have given the matter a bit of thought — and there certainly are such people nowadays — believe hat tomato consumption is highly significant for human beings. This true, and it could also be said for animals, for it would be quite possible for animals to get used to eating tomatoes. Tomatoes have a significant effect on everything that tends to separate itself from the organism and develop an independent organization within the body. Two things follow from this. On the one hand, it confirms the statement of an American researcher, namely, that under certain circumstances, adding tomatoes to the diet can have a beneficial effect on an unhealthy human liver. Because the liver is the organ that works most independently in the human body, when the liver is diseased, especially in animals, it could also be treated in general with tomatoes. Here we gain insight into the relationship between plants and animals. On the other hand, therefore — let me say this in parenthesis — people diagnosed as having cancer should immediately be forbidden to eat tomatoes, because cancer from its very inception makes a certain part of the human or animal body independent of the rest of the organism. But now we need to ask ourselves, why tomatoes in particular have such a strong effect on everything that tends to be independent, on everything that specializes and separates itself off from the rest of the organism? This tendency is directly related to what tomatoes prefer and require for their own growth. Tomatoes feel most at home when they are given manure or compost that is as dose as possible to the form in which it comes from the animal or other source. They prefer raw compost that hasn’t had much chance to he transformed through natural processes. If you just throw all kinds of scraps together onto an untidy heap, and give the heap no further treatment or preparation you’ll find that the most beautiful tomatoes will grow there. And it you were to use compost made from tomato plants, that is, if you were to let the tomatoes grow in their own compost, they would grow even better. Tomatoes have no desire to step outside of themselves, no desire to step outside of the realm of strong vitality. That’s where they want to stay. They arc the least social beings in the entire plant kingdom They do not want anything from strangers, and above all, they do nor want any fertilizer that has gone through a composting process; they reject all that. This is the reason that they can influence what works independently within the human or animal organism. Here is what Carol Williams says about tomatoes in one of my favourite books, Bringing a Garden to Life. “When there is no more chance of frost, it is time to set out tomato plants. There is more lore about growing tomatoes than about any garden plant I know. I think this is because even after four hundred years of cultivation in the northern hemisphere, tomatoes still have an exotic, magic quality—their fruit so invitingly shiny and scarlet, yet a bit poisonous when green, their growth rampant and wild. Gardeners think they have to trick them into submission. “A special gross feeder, special in that they like raw manure and tolerate few other plants It really is very bad to plant them near peaches. Besides raw manure they like compost made from tomatoes waste. Give a Valerian 507 seed bath and sow the usual way into seed boxes. Spray 500 after sowing. When planting seedlings into final place make a sloppy mix from fresh cow manure and 500, put roots of seedlings into plant hole, pour in a little of the sloppy mixture, then press soil around roots, so the plant stands up firmly. Give another application of 500 when plants are ready to move and 501 just before the first flowers are expected. Give one or two applications of 500 and 501 combined in late afternoon during fruiting season. Sow on a fruit day. Spray 501 on a fruit day. Make the bed a fixture outside your vegetable garden and use this year in, year out for your tomatoes. Parsley is a companion plant for tomatoes and is grown on the tomato bed, but each year on a different spot. Awoke to large piles of icy hail around the place , 43.5 mm in the rain gauge for the past 24 hours and more rain,hail and wind on the way I headed to the polyhouse to get things done.Normally in winter polyhouse there are daily harvests of greens for us and the chooks. Our flock require a large basket full of greens to be blended into their mash daily and the outside gardens never grow fast enough in winter to keep up. This year has been quite different as I was out of action from Spring to Autumn with firstly with a broken leg (Thanks to neighbours goat, which is still managing to climb the fence to my vegies garden.) Then a new knee! Over this time the polyhouse became covered in lovegrass whose seeds latch on to your clothes and was proberly responsible for the invention of Velcro. To remove this weed required me to wear a polyester type bee suit,and long gumboots and still some seeds ended up on my socks.Once removed the beds where dug over to remove invading roots , the soil had mineralized , which means when you push the spade in you hear a crunching sound similar to putting a spade into gravel or the grittiness of potting soil or when compost has been left too long. It was now late May and getting too late to plant most things even in side. The two centre beds had some of my humus rich compost dug in and where planted with brought in brassicas seedings and lettuce,kale and silver beet seedlings from my garden. The outside beds where left dug over and watered to get the weeds to germinate and today I dug them in as a green manure and then stirred some biodynamic barrel compost and treated all the beds. Next week I will dig in some humus rich compost and do another stirring of barrel compost and it will be ready for spring planting and some biodynamic 500 to get an early start for the summer vegies.